Stevie Ray Vaughan ignited the blues revival of the '80s, with his astonishingly accomplished guitar playing, He drew equally from bluesmen like Albert King, Otis Rush, and Muddy Waters and rock & roll players like Jimi Hendrix and Lonnie Mack, as well as the stray jazz guitarist like Kenny Burrell, developing a uniquely eclectic and fiery style that sounded like no other guitarist, regardless of genre. Stevie bridged the gap between blues and rock like no other artist had since the late '60s. For the next seven years, he was the leading light in American blues, consistently selling out concerts while his albums regularly went gold. His tragic death in 1990 only emphasised his influence in blues and American rock & roll. Born and raised in Dallas, Stevie began playing guitar as a child, inspired by older brother Jimmie. When he was in junior high school, he began playing in a number of garage bands, which occasionally landed gigs in local nightclubs. By the time he was 17, he had dropped out of high school to concentrate on playing music. Stevie's first real band was the Cobras, who played clubs and bars in Austin during the mid-'70s. Following that group's demise, he formed Triple Threat in 1975. Triple Threat also featured bassist Jackie Newhouse, drummer Chris Layton and vocalist Lou Ann Barton. After a few years of playing Texas bars and clubs, Barton left the band in 1978. The group decided to continue performing under the name Double Trouble, which was inspired by the Otis Rush song of the same name. Stevie became the band's lead singer. For the next few years, Stevie Ray Vaughan and Double Trouble played the Austin area, becoming one of the most popular bands in Texas. In 1982, the band played the Montreux Festival, as the first unsigned artist to play there. Their performance caught the attention of David Bowie and Jackson Browne. After Double Trouble's performance, Bowie asked Vaughan to play on his forthcoming album, while Browne offered the group free recording time at his Los Angeles studio. Both offers were accepted and Stevie laid down the lead guitar tracks for what became Bowie's Let's Dance album in late 1982. Shortly afterward, John Hammond, Sr. landed Stevie and Double Trouble a record contract with Epic, and the band recorded its debut album in less than a week at Browne's studio. The debut album, Texas Flood, was released in the summer of 1983, a few months after Bowie's Let's Dance appeared. On its own, Let's Dance earned Stevie quite a bit of attention, but Texas Flood was a blockbuster blues success; receiving positive reviews in both blues and rock publications, reaching number 38 on the charts and crossing over to album rock radio stations. Bowie offered Stevie the lead guitarist role for his 1983 stadium tour, but he turned him down, preferring to play with Double Trouble and promoting his own album. Besides which he was only offered union rates, so figured he would be better off without it. Stevie and Double Trouble set off on a successful tour and quickly recorded their second album, Couldn't Stand the Weather, which was released in May of 1984. The album was more successful than its predecessor, reaching number 31 on the charts; by the end of 1985, the album went gold. Double Trouble added keyboardist Reese Wynans in 1985, before they recorded their third album, Soul to Soul. The record was released in August 1985 and was also quite successful, reaching number 34 on the charts. Although his professional career was soaring, Stevie was sinking deep into alcoholism and drug addiction. Despite his declining health, he continued to push himself, releasing the double live album Live Alive in October of 1986 and touring extensively. Late in 1986 Stevie collapsed whilst on tour in Germany and was rushed to hospital, where he was warned, that if he didn't clean up, he would be dead very soon. The rest of the tour was cancelled and then followed time in rehab, before emerging clean and sober, and ready to work again. The band undertook a US tour in 1987, completing 65 gigs, a somewhat mediocre total by his normal standards. Stevie performed a number of concerts in 1988, including a headlining gig at the New Orleans Jazz & Heritage Festival, and wrote his fourth album. The resulting record, In Step, appeared in June of 1989 and became his most successful album, peaking at number 33 on the charts, earning a Grammy for Best Contemporary Blues Recording, and going gold just over six months after its release. In the spring of 1990, Stevie recorded the album Family Style with his brother Jimmie, which was scheduled for release in the autumn of that year. In the late summer of 1990, Stevie and Double Trouble set out on an American headlining tour, with Joe Cocker. The highlight of the tour was two nights with Eric Clapton, Jimmy Vaughan, Buddy Guy and Robert Cray at Alpine Valley, East Troy, Wisconsin on 25th and 26th August 1990. After the second show, which climaxed with an encore of Sweet Home Chicago, with everybody on stage, most of the entourage headed to board four chartered helicopters to take them back to the Windy City and a good night’s rest. Clapton recalls how foggy the early morning of August 27 was. “I didn’t want to fly at all. I was wiping condensation off the windows and thinking: ‘We’re all gonna die.’ Then they took off and above the weather was clear sky and starlight." Stevie was on a flight with three of Clapton’s crew. In the early hours it was reported they never landed in Chicago. In fact their pilot had taken off and crashed into a ski run on the side of a mountain after 42 seconds. He was only 35 years old. Shannon and Layton sat in their hotel room and wept. They’d gone into Stevie’s room hoping he’d be there, but the bed was still made with chocolates on the counterpane and the alarm radio was playing The Eagles’ Peaceful, Easy Feeling. A strange thing happened at that last gig. Those who knew Stevie said he played with a halo of light around him. His guitar tech Rene Martinez remembered him giving everyone a huge hug and telling them how much he loved them. He had an aura about him, like a premonition. Family Style, Stevie Ray's duet album with Jimmie, appeared in October and entered the charts at number seven. Family Style began a series of posthumous releases that were as popular as the albums Vaughan released during his lifetime. The Sky Is Crying, a collection of studio outtakes compiled by Jimmie, was released in October of 1991; it entered the charts at number ten and went platinum three months after its release. In the Beginning, a recording of a Double Trouble concert in 1980, was released in the fall of 1992 and the compilation Greatest Hits was released in 1995. In 1999, Vaughan's original albums were remastered and reissued, with The Real Deal: Greatest Hits, Vol. 2 also appearing that year. 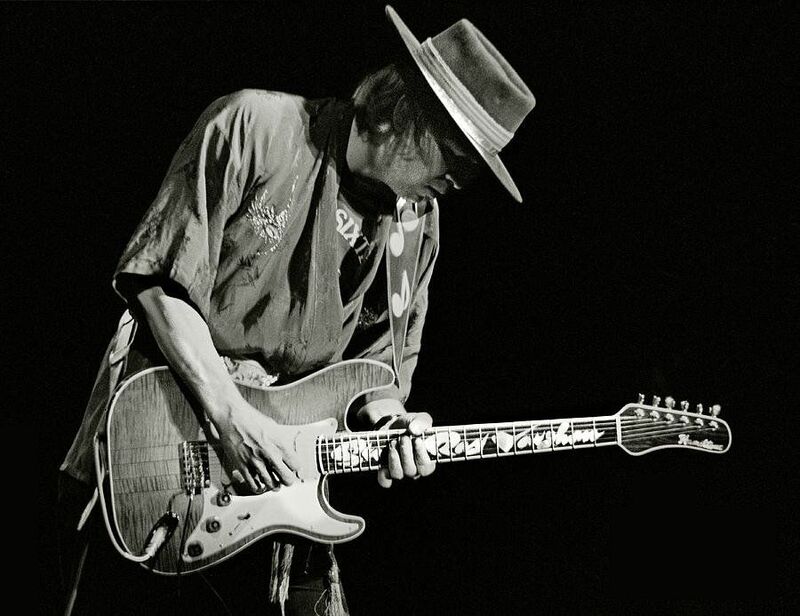 2000 saw the release of the four-disc box SRV, which concentrated heavily on outtakes, live performances, and rarities.